Considering the large number of restaurants, restaurant employees, and restaurant patrons across the nation, it is essential that local health departments (LHDs) establish and manage retail food regulatory programs. 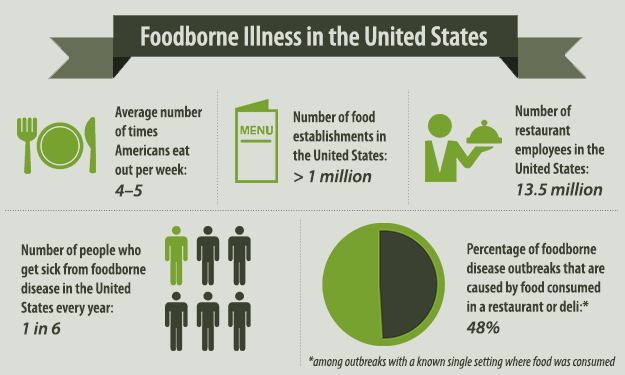 LHDs play a critical role in protecting the public from foodborne illnesses through these programs, which often include vital activities such as inspecting restaurants, responding to foodborne disease outbreaks, and ensuring that restaurant employees are trained in food safety practices. The Food and Drug Administration (FDA) developed the Voluntary National Retail Food Regulatory Program Standards (Retail Program Standards) to guide LHDs in designing and managing a retail food regulatory program and provide a means of recognizing programs that meet the standards. The Retail Program Standards consists of nine standards that enable LHDs to critically assess and improve their retail food regulatory programs. The FDA partnered with NACCHO to create a mentorship program for the Retail Program Standards as part of an ongoing effort to increase the program’s utility among LHDs. The mentorship program matches LHDs seeking assistance with the Retail Program Standards with seasoned LHDs to help advance the mentees work towards meeting the standards while building sustained capacity within the LHD. LHDs submitted applications to participate in the mentorship program to share experiences and learn about tools and resources related to the Retail Program Standards. The mentorship program began in 2012 with nine LHDs; 15 LHDs participated in the second cohort, and the program has now grown to include 18 LHDs in the third cohort. Staff from mentee LHDs have found the program to be a great learning and networking experience. As a testament to the value of the mentorship program, participants have returned as mentors in subsequent years. Learn more about the mentorship program and the participants at http://www.naccho.org/topics/environmental/foodsafety/retail/index.cfm. This entry was posted in environmental health on April 25, 2014 by nacchovoice.